“Resident Evil” is a name that’s hard to ignore in today’s video game landscape. For many, the name indicates a trendsetter in what would come to be known as the “survival horror” genre, and for others, it evokes a years-long roller coaster ride of ups and downs and hits and misses. For developer and publisher Capcom, it is a flagship title and multi-million selling franchise, and for the fans, it brings forth a wealth of personal experiences marked by triumph, dedication, and catharsis. For me, it is all of these things, as well as what might be one of my favorite series ever. The games we praise the most tend to be ones with which we’ve formed close personal attachment, whether it’s stories of overcoming hardships in Dark Souls, bonding with a sibling over Mario Kart, connecting with the Vance family and Dog in Half-Life 2, or having everything just come together and work in Civilization. I don’t have any one particular story when it comes to Resident Evil, but it’s been a long experience with roots in my childhood. I’ve made friends with people who are also fans, and the community is full of members who are perceptive of statistics and techniques, much like the players and researchers who dig into From Software’s Souls series. With the first entry in the franchise celebrating its twentieth anniversary this past month, I’ve been looking back over the time I’ve spent getting immersed in its lore and action. I was around ten years old when the first three games released, and there was no way I’d be able to experience them for myself with the little money I had. Even if I did, I wasn’t sure if I could even work up the courage to play them or get through the games without failing horribly. I still found myself interested with the influx of horror games and the way people were immersing themselves in Resident Evil, Silent Hill, System Shock, Clock Tower, and more. It wasn’t until much later that I got a chance to play Resident Evil on my own terms. A good friend of mine had collected physical copies of the original trilogy for PlayStation, and he was gracious enough to let me borrow them. Ten years had passed since release, but it was better late than never. With that, I started with Resident Evil: Director’s Cut. As this piece focuses on the first game in particular, I will be referring to it as RE1. Right off the bat, RE1 shows its horror film inspirations through the use of live-action footage. It hasn’t aged well, but there’s something kind of charming and fascinating about a real group of actors in costume, sparse lighting to mask the props and fake gore, and the silly overdubbing. As far as I know, the introductory sequence was filmed somewhere along the Tama River in Kanagawa or Tokyo, Japan, and the cast was made up of various unknown actors from Europe. It’s interesting that the development team opted to hire real people to portray their characters rather than use their technology to render cutscenes in-house, and it was noted that none of the actors involved were professionals by any means. This may also be telling of the situation at Capcom at the time. RE1 feels like a low-budget horror movie probably because the game itself was being developed on a relatively low budget for a big company like Capcom—somewhere well below 1 million USD by today’s standards. 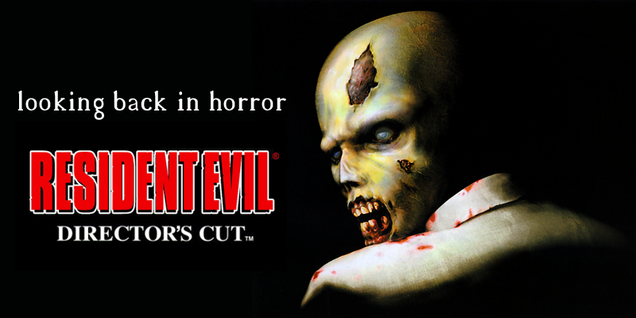 Capcom also didn’t have too much faith in the project; though there were up to eighty staff members working on the game at its peak, many of the company’s more experienced staff were moved to other games, leaving a group consisting mostly of newcomers working on RE1 with director Shinji Mikami. In a way, I think this worked out in the team’s favor, not to mention how it benefitted Capcom as a whole; the game was a surprise smash hit that went on to sell several millions of copies. The differences between the two protagonists aren’t specified, leaving you to find them out on your own. Or use a guide. Perhaps it’s because of its team of fresh faces that RE1 feels careful and deliberate in its design. The game went through various iterations during production: a first-person view, which would be revisited in the DS port; fully-rendered 3D environments; cooperative play featuring both protagonists simultaneously, a feature which would return later for Resident Evil 0. Like Alone in the Dark, the player chooses one of two main characters, Chris Redfield or Jill Valentine, at the start of the game. Unlike Alone in the Dark, Chris and Jill each have their own distinct advantages and disadvantages, and their adventures through the Spencer Mansion run quite differently from each other. The development team could have easily just had the same game with two different characters, but the additional individual characteristics make for some different playthroughs that add to the title’s replay value, which works well when an average playthrough takes about three to five hours. Throw in a bonus Arranged mode that modifies enemy and item placement and you’ve got four different variations on a single disc! There is little to no filler; downtime between major events and encounters consists primarily of manual exploration of the mansion, and the key items lying around point you in the direction to go next. Map details are light, but you might be able to memorize the contents of each room. Eventually. There is also a sense of balance in combat and exploration that I find works well here and becomes less apparent with each subsequent Resident Evil. The first half of RE1 consists of the initial mansion exploration, with the occasional zombie, dog, or crow serving as obstacles. Ammo is a bit scarce here, so some strategy comes into play—players can choose which enemies to eliminate and which to avoid. You can prioritize clearing out high-traffic areas to make traveling through them easier on yourself, which is a choice I can appreciate. During the second half, when more dangerous enemies are on the loose within the mansion, the amount of ammo you find is increased, but your approach to enemies and the weapons you decide to use still require caution. Chris and Jill have different carrying capacities for items, with Jill having a distinct advantage over Chris. Managing your character’s inventory is required to ensure you have room to pick up important objects you need to advance, so there must be a balance between weapons, ammo, healing items, and available slots. The save system is a particularly unique case of balance for the early games in the series. There are typewriters at specific locations and a finite number of ink ribbons to record your progress. Pressing forward to conserve ink ribbons may put you at risk for a long trek back if you fail, but saving precariously decreases the value and efficiency of each use and may force you to take a big leap forward anyway when you’re running low. Surprising someone with a gun is never a good idea. There’s something I love about the directness and straightforwardness of combat in RE1. The controls do plant your character in place and it’s clunky if you need to stay mobile during an encounter, but for the most part, you’re facing one or two enemies at a time. You take aim, most likely utilizing the game’s default auto-aim system, and fire. Random factors are minimal, with the exception of your chances of a critical instant-kill headshot on a zombie. You aren’t fighting an entire group of zombies like in RE2 or RE3. You aren’t having projectiles thrown at you from a distance like in RE4 or RE5. Multiple enemies aren’t leaping at you from different directions and slamming into each other like in RE6. You don’t have to worry about the instant death attacks that began to creep into the games after RE1. It’s simple, and sometimes simple is good. The plot has held up decently well over the past twenty years. RE1 is as character-driven as it is about the dark side of a powerful company like Umbrella Corporation. Although the major characters push the plot forward, there isn’t any particular sense of growth. Chris and Jill don’t have character arcs, and they are largely bystanders until the game’s second half. As the story progresses, their team falls apart one by one, but it’s hard to feel anything about characters you barely see or hear about. Later on, once the antagonist is revealed, Chris and Jill decide to confront them, but they fail to react in a way that gets the player invested. (“You’re pitiful!”) If anything, Jill’s supporting character Barry has more stake and a potentially more interesting arc than either protagonist, and sometimes I wonder if a sidestory featuring Barry and his point-of-view would pull together RE1's narrative. Stepping back, the events that transpire are mildly interesting on their own, but taking the sequels into account, they’re essentially a springboard for everything else in the series. The chaos spreads into nearby Raccoon City, leading the U.S. Government to nuke the town entirely. Chris and Jill eventually work on exposing Umbrella and the corruption in Raccoon City. Umbrella falls, but the technological and biological advances they’ve made have lasting repercussions for years to come. The story slightly falters in that Umbrella is cast as wantonly unethical and destructive, to an almost comical degree. It is a harsh authoritarian institute that doesn’t hesitate to use force and death to silence the opposition. There is no sense of “grayness” when it comes to discussing the company; human experimentation is rampant, dangerous subjects can’t be contained, and researchers have crossed some serious lines in the pursuit of science. It’s hard to sympathize with the employees you hear about in the files you come across throughout the game. The people working for Umbrella don’t even really like each other, and their personal accounts are filled with paranoia and mistrust. The same goes for the antagonist, who also gets an evil laugh to boot. How the company hasn’t already imploded is a mystery. It only gets worse after RE1 as subsequent games elaborate on the company’s founders. Did you guess that they’re all completely insane megalomaniacs? You are correct. Haw haw, you must be from the Bravo Team! What a bunch of goofballs! RE1 isn’t a masterpiece by any means, but it’s a milestone of an adventure game for the ‘90s. It provides a smoother experience than Alone in the Dark and a more cohesive, grounded setting than Sweet Home, games that inspired the development of Resident Evil. It avoids illogical puzzle solutions and dead-end scenarios that result from malicious and lazy point-and-click adventure design. It pulls together action, adventure, mystery, and horror elements into an interesting package that has terrified players for years, and it features an unintentionally hilarious English translation primarily handled by the dev team that has been a long running joke in the community. And it’s an interactive work that I won’t be forgetting any time soon. “Looking Back in Horror” is a personal retrospective series written by Eric K. (Muckamuck) that is centered on Capcom’s Resident Evil franchise. It was written for Talk Amongst Yourselves, Kotaku’s community-run blog, with the intention of stimulating and facilitating discussion of the franchise with the reader base.